Publications - Resources - John Snow, Inc. 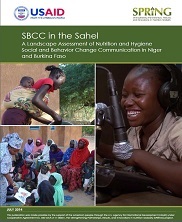 This landscape analysis consolidates existing information about the range of actors (government, donors, and implementing partners), relevant policies and programs, formative research, and a number of approaches, tools, and products currently used to support or develop maternal, infant, and young child nutrition (MIYCN) and hygiene-related SBCC programs in Niger and Burkina Faso. Issues, opportunities, and gaps in programming have been identified, as well as existing platforms on which new programs can potentially build. Based on these findings, specific recommendations to REGIS-ER and other programs (existing and future) are presented. JSI/SPRING Project, 2014.